It looks great, delivers a wonderful shower experience and the price is amazing! The elegant GROHE Euphoria 110 Massage shower set adds instant style and comfort to your bathroom. The kit contains a 110mm hand shower, a 600mm rail and a 1750mm hose. And it’s packed with a lot of smart features. 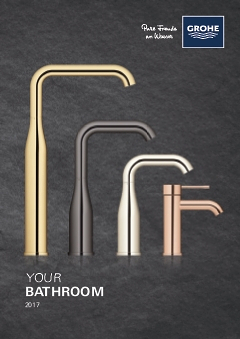 GROHE EcoJoy technology limits water flow to 9.5 l/m which saves water and money without compromising performance. You can choose which of the three sprays suits your mood best: the soft Rain Spray, the SmartRain Spray with less water or the invigorating Massage Spray, that pulses to relieve tension. Plus the GROHE SprayDimmer allows you to smoothly reduce the flow rate even more. GROHE DreamSpray ensures an even distribution of water to all the spray nozzles. Thanks to the convenient GROHE EasyReach tray, you also have your shampoo and shower gel at your fingertips while the TwistFree function helps you to keep the shower hose under control! The SpeedClean silicone nozzles ensure you have maintenance under control as limescale is easily removed with a quick wipe. Installation is also swift and easy: the GROHE QuickFix system has an adjustable upper bracket, so you can fit the rail using existing holes.